Chromaroma is game based around Transport for London’s Oyster travel cards and the key fobs used to unlock bicycles in London’s hire scheme. Players movements are tracked and shown as online visualisations and various competition mechanics are available including exploratory missions. 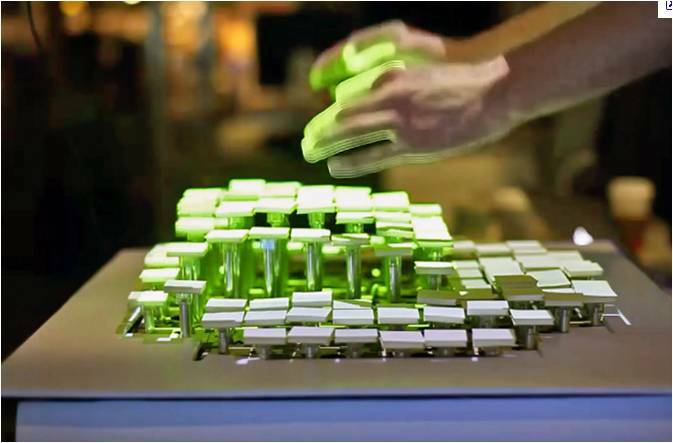 MIT have developed a new interface whereby a person’s hand movements control a mechanical piston type surface. This allows the user to create real time 3D patterns and text or ‘uncover’ hidden designs. 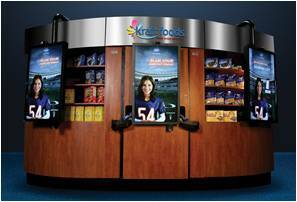 Intel and Kraft have developed a digital screen kiosk that will scan a person’s face and suggest products and recipes based on perceived age and gender. While such recognition technology has been around for many years now it’s only recently that brands are starting to think seriously about content applications. If customers swipe their loyalty card the kiosk will also sync recipes with Kraft’s ifood mobile app. The app allows people to add items to their mobile phone based shopping list by scanning product barcodes and has a couponing function.